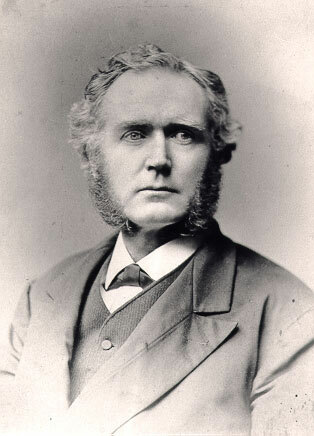 On March 13, 1860, a certain John Ballou of Cincinnati, Ohio, took out a US patent №27418, for a calculator. It seems the device never went into production and only the patent model survived to the present, kept in National Museum of American History, Washington (see the lower image). 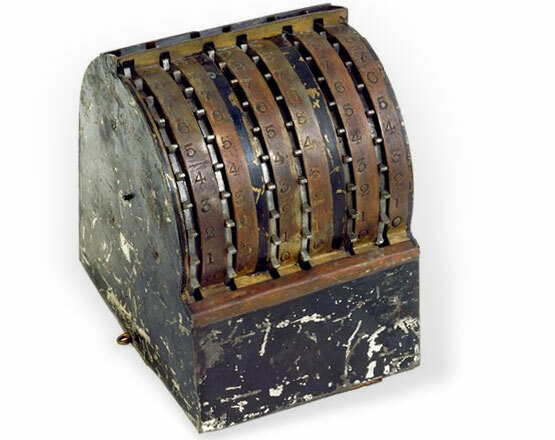 The calculator of Ballou was a small metal and wood adding machine, with measurements: 10 cm x 11.5 cm x 13.9 cm. It was somewhat similar to the Jabez Burns' addometer, patented at the same time. The lever-set adding device has a metal casing, painted black and a wooden bottom. The curved front of the machine has slots for six movable wheels, the right-hand wheel operated for units, the next for tens, etc. The part of the case to the right of each ring is marked with the digits from 0 at the bottom of the curve to 9 at the top. A crosswise shaft in the machine carries a series of six toothed metal rings that fit between the openings in the case and serve as finger wheels, ratchets, and registers. The digits are inscribed around their edges of the rings, next to the teeth. One digit of each wheel is visible at the top of the machine, showing the result when numbers are entered by turning rings forward. A tens carry mechanism is also provided—the left side of each ring has a pin (a shifter) every ten places, which drives the adjacent wheel when carrying is required.